This summer, I ordered a DNA testing kit from FamilyTreeDNA. Having already completed autosomal DNA testing with AncestryDNA, I opted to order a Y-DNA 37 test from a different company. Testing the Y-chromosome offers different results than autosomal testing. The latter helps you carve a picture of your entire genetic composition, roughly equal parts from each ancestor in each generation. That is, each of your eight great-grandparents contributes roughly 12.5 percent to your genetic composition with these tests. The Y-chromosome test and the mitochondrial DNA test are different. The Y chromosome provides clues only to patrilineal ancestry, your father, your father’s father, his father, and so on, back through time, through only the male contributions. 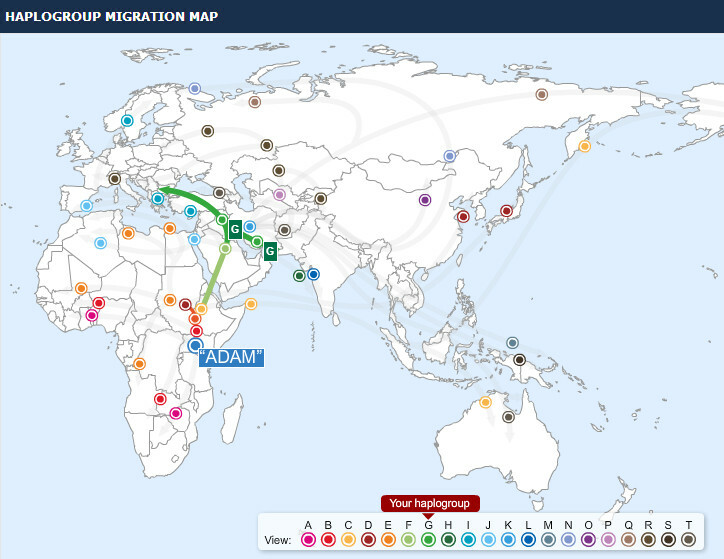 The test uses mutations in the genes to determine ancestral heritage, and through this information, can classify every male into a migration group. Any males with matching genetic markers has a good chance of being related through a recent common ancestor. I enrolled in FamilyTreeDNA and provided the details of my furthest confirmed paternal ancestor, Moses Landes. While I do have one document indicating Moses’s father’s name was Joseph, I don’t have any birth or death dates for him, so I didn’t include that information in my profile. I joined a group on the website where other Landes (or Landis) descendants meet online to discuss their findings. My genetic composition does not fit with the other members of this Landes group. It’s not surprising, given that our surname does not extend very far. From what I’ve been told, this family did not go by the name Landes in Romania. 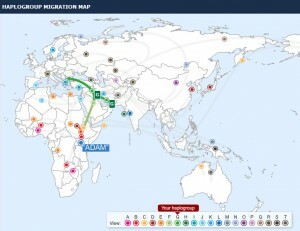 The DNA indicates I am a member of haplogroup G2c, a branch of haplogroup G. This haplogroup represents Ashkenazi Jews, and some evidence suggests that the G2c branch reflects a migration out of Sicily to northeastern Europe in the Middle Ages. FamilyTreeDNA links me to others who have had their DNA analyzed and whose DNA markers are similar to mine. There are no exact message for all 37 markers tested, but when limited to 12 markers, the site’s database offers me eight exact matches and 131 matches one step away. Evaluating 25 markers, I have two matches two steps away, one of whom is also two steps away when evaluating all 37 markers I’ve tested. There is a 91 percent chance according to FamilyTreeDNA than he and I share a common ancestor within 12 generations. Unfortunately, I’m not sure where to go from here. The Family Finder service, another autosomal DNA test, might provide me more insight into my relatives, considering FamilyTreeDNA’s database is more extensive than AncestryDNA’s at this time. The Mitochondrial DNA will provide migration information for my maternal ancestors. I’m not prepared at this time to spend more money on testing until I can glean more value for the tests I’ve already purchased.